These KPIs were developed by the Northern Territory (NT) Aboriginal Health Forum, which comprises of the Commonwealth Department of Health, Aboriginal Medical Services Alliance and Northern Territory Department of Health. Processes for data collection from the various health services have been defined, and data delivery from all NT community health centres commenced on 1 July 2009. The NT AHF undertook a project to further develop KPIs measuring Aboriginal health outcomes in such areas as chronic disease, antenatal care, babies, child health and adult health. This project identified 44 aboriginal health KPIs and agreed to initially implement 19 of these. The NT AHF support for this work represents a unique and significant breakthrough in collaborative decision making, unparalleled in other Australian jurisdictions. These papers below outlines the historical work on Aboriginal Health KPIs. Options Paper, Population Denominators for Primary Health Care Indicators, Steve Guthridge, Director, Health Gain Planning, Department of Health and Community Services, 8 March 2006. NTAHKPI suite Stage Two, [ensure this doc is moved into ePub and link to that] Development of a Performance Reporting System for Indigenous Primary Health Care, Report of a project by the Cooperative Research Centre for the Primary Health Care Access Program Working Group, Pam Gollow, June 2003. The chair of the NTAHF is the Data Collection Sponsor with overall responsibility for the full-NT-wide data set or collection. This role has been delegated to the KPI Steering Committee consisting of representatives from the NTAHF partners. The SC has responsibility for considering requests for access to data and reports, endorsing any additions or changes to the KPI’s. A Technical Working Group and a Clinical Reference Group, each with members from the 3 NTAHF partners reports to Steering Committee. The role of the TWG is to review the implementation of changes or additions of new NT AHKPIs, and make recommendations to the SC on technical issues that must be addressed in order to ensure that funders, health boards and management can receive timely and accurate reports from data extracted from all Patient Information Recall Systems (PIRS) across the NT. The NT AHF is able to present a NT wide view of health outcomes in urban and remote Aboriginal primary health care throughout the Northern Territory. This information has been fed back to communities through standard reports and has streamlined and simplified primary health care reporting requirements at both a Territory and Commonwealth level. This evidence is being used to show trends in individual and population Aboriginal health outcomes and inform improvements in planning and policy development. Clinical information is currently being collected from a mixture of Northern Territory Department of Health data sources such as the Primary Care Information System as well as Aboriginal Community Controlled Health Organisations' Patient Information Recall Systems (PIRS) such as Communicare. The standard NT AHKPI reports are being provided to each Aboriginal Primary Health Care service provider with comparisons on each health community result against the overall NT results. This baseline information is crucial in assessing and improving Aboriginal health outcomes as well as assisting the further development of future indicators and providing information towards developing an NT wide model of Continuous Quality Improvement (CQI). Evidence based outcomes with inform Aboriginal Health Forum planning and assist with the review of the Expanded Health Service Delivery Initiative as well as a basis for the NT CQI model. Ensuring that the NT can meet emerging mandatory national reporting requirements. Approved changes to the existing NT AHKPI definitions, or new KPIs will be completed twice a year according to the NT AHKPI Annual Reporting and KPI Change Cycle Calendars. [ensure this doc is moved into ePub and link to that] This will enable the substantial technical work to occur within each Patient Information Recall System (PIRS), in the Data Extraction tool, and in the NT AHKPI system within the Northern Territory Department of Health hosted Data Warehouse. 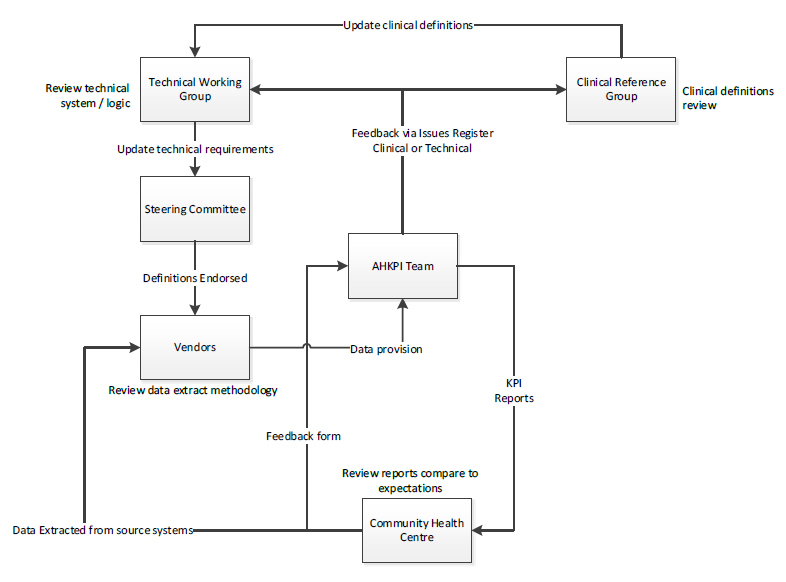 The diagram below outlines the flow process of changes or additions to the NTAHKPIs. 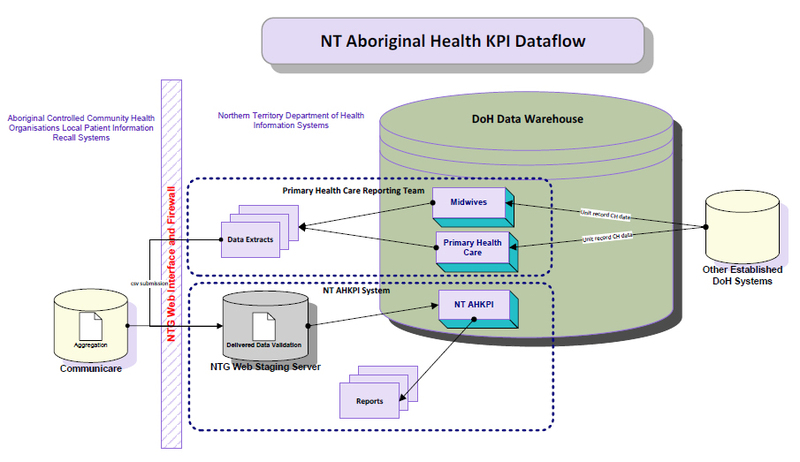 The diagram below outlines the flow of data from the source system to the NT AHKPI program.